Black Leaf Films creates powerful documentaries that tell stories from unique perspectives, challenge preconceptions and reveal often hidden structures of power. Whether we're doing pure observational documentaries or current affairs investigations, our films seek to portray subjects fairly while explaining the underlying reasons behind social justice and human rights violations. We have an international frame and are experienced at filming in areas as diverse as Palo Alto and Palestine; Brazil and Boston; Syria, Sierra Leone and Seven Sisters in North London. Our lead members, Ladan Anoushfar, Dan Davies, Ana Naomi De Sousa and Yasmin Fedda have between them directed, produced and exec’d films and documentary series for major broadcasters and online outlets including BBC World, Arte, PBS, The Guardian, Al Jazeera English, and Channel 4, as well as feature documentaries that have been shown in festivals around the world. Our work has been been nominated for a BAFTA, an Asian TV Award, and a Foreign Press Award and we have won awards from Peabody and the New York Festival. Ladan Anoushfar is an award-winning documentary filmmaker who has produced and directed films for BBC World, The Guardian, Al Jazeera, and the Aga Khan Architecture Awards. She trained with cinema legend Abbas Kiarostami and double Oscar winner Asghar Farhadi in Iran where some of her projects are set. Her recent film The Sanctions Hotel won a silver medal at the New York Festivals Best Film and TV Awards 2018 and was nominated for a Foreign Press Association award. Ana Naomi De Sousa is an award-winning director and journalist. As a filmmaker she has made documentaries for Al Jazeera and collaborated with the Turner-prize nominated Forensic Architecture. Her interactive web documentary about the Syrian military prison Saydnaya for Forensic Architecture won a Peabody award in 2017. She also writes about spatial and cultural politics for platforms including the Guardian and Al Jazeera. She is currently working on a feature documentary about British boxing. Dan Davies is an executive producer, director and writer whose work has been broadcast on the UK’s Channel 4, ITV, the BBC and Al Jazeera. He has created, series produced and executive produced numerous documentary series including Rebel Architecture, Rebel Geeks and Europe’s Forbidden Colony. He is currently making a feature documentary about the housing crisis in London. As a writer his plays have been performed on Resonance FM, BBC Radio 4 and venues across London including the Space, the Arcola and the National Theatre Studio. 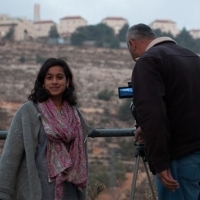 Yasmin Fedda is a BAFTA-nominated documentary director whose films have been broadcast on the BBC and Al Jazeera and screened at festivals around the world. Her feature documentary Queens of Syria (2014) won the Black Pearl award at the Abu Dhabi Film Festival and best female director at Carthage Film Festival. Her next feature doc, Ayouni (in production), is about people forcibly disappeared in Syria. Yasmin has a PhD in Transdisciplinary Documentary Film, and is also co-founder and director of Highlight Arts, an organisation that works with artists in times of conflict. Between us we speak 7 languages including Arabic, French, Portuguese, German and Farsi.